Lisa Ledet & Stephanie Ehret have the women's FKT, 10h57m (from the Knowles TH) on April 7, 2007 (with Buzz Burrell & Peter Bakwin). Mee & Knowles are two spectacular and remote canyons in the Black Ridge Canyons Wilderness of the McInnis Canyons National Conservation Area in western Colorado. 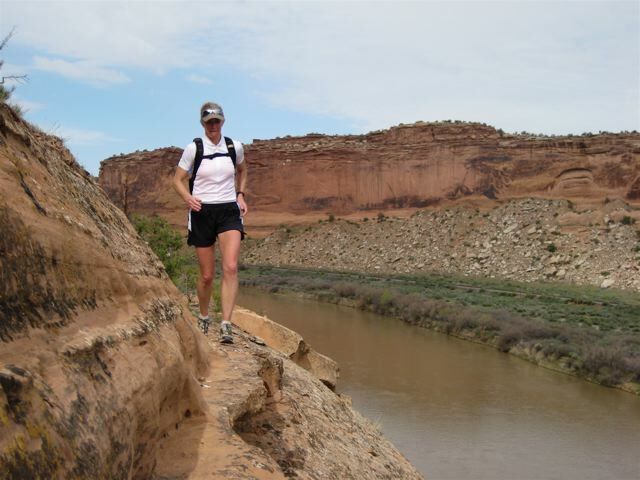 If you like rugged desert landscape and don't want to see other people, this route is for you! Closing the loop requires around 38 miles of on- and off-trail hiking/running with somewhat tricky navigation. 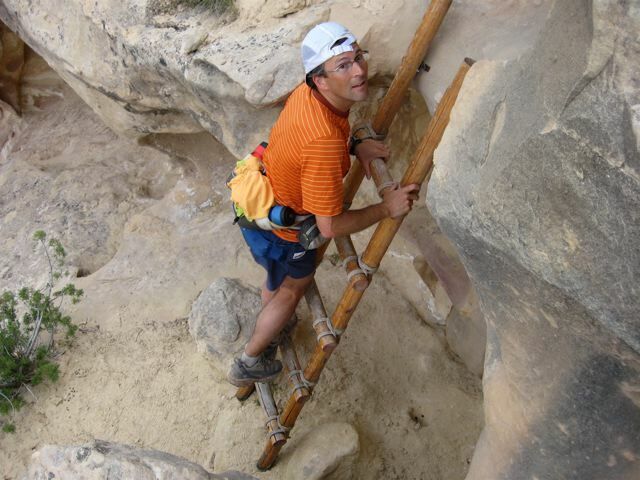 The route is described in Michael Kelsey's Canyon Hiking Guide to the Colorado Plateau. There are 2 main trailheads for this route - Mee & Knowles. The Knowles TH is about 1.1 miles off of the actual loop, so starting there adds 2.2 miles to the trip. The Mee TH is on the loop, but the access road is probably worse and possibly 4WD. Lisa Ledet, Stephanie Ehret, Buzz Burrell and Peter Bakwin ran the route from the Knowles TH on April 7, 2007, in 10h57m. This remains the women's FKT. Peter Bakwin returned solo on May 3, 2011, and ran the same route from the Knowles TH in 8h57m, as reported below (with GPS track). His time without the Knowles TH out & back was 8h32m. Giff Walters bested this time by 11 minutes, running 8h21m from the Mee TH on May 28, 2016, as reported below. Amazingly, Andrew Bentz independently ran the route on the very same day as Walters, closing the loop in a very speedy 7h21m! Set a new mark on this today, 5/3/11, at 8h57m. My GPS gave 36.3 miles for the whole thing from the Knowles TH. It occurs to me now you could save 2.2 miles by starting at the Mee TH & avoiding the Knowles TH out & back. For reference, my time to close the loop (w/o the out & back section) was 8h32m (from my GPS). I started at 5:51AM, just when it was light enough. It was darned cold (below freezing), but warmed up nicely later. I found good water running the full length of both canyons. I didn't see anyone all day (Tuesday) until the spectacular climb out of Mee Canyon, when I caught up with Stan Wagon, the founder of Ultrarunner Magazine! He & his partner had visited the huge undercut in upper Mee. From the Mee TH, I cruised pretty well along the cow path back towards my car until taking a wrong turn near the stock tank 2-3 miles out & ended up navigating cross-country via GPS to get back on track. Oops! Otherwise, no problems with navigation. I estimate that a little over half of the route is off-trail. That includes pretty much all of Knowles once you reach the bottom of the canyon, much of the way along the Colorado except near Black Rocks camp, and most of Mee except for an excellent trail for the first couple of miles after you leave the Colorado. Up top its mostly old cow paths. My GPS track is here (gpx). Thanks for the good info. 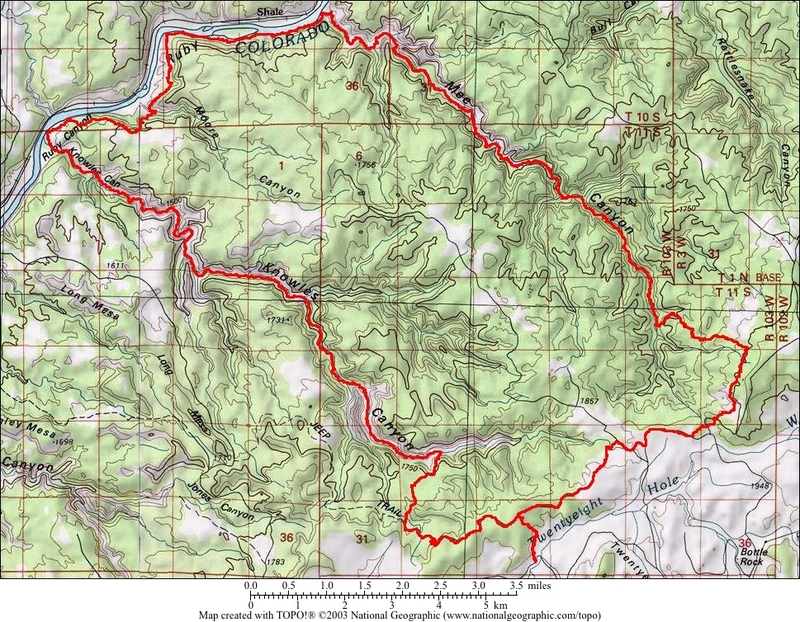 My son and I are headed to do the Knowles/Mee loop this weekend (backpacking). When you say you could have saved 2.2 miles by starting at the Mee TH, is that by taking a different, off-trail route out of Knowles? I wasn't sure what you meant by that. Thanks for any additional info you might be able to provide. It would be nice to save the 2.2! - Dave M.
Hey Dave, Cool! It's a great loop (if you like classic desert terrain as much as I do) and not often done. I noticed that my map wasn't showing up in the main post above, I fixed that now. The Knowles TH is 1.1 miles off of the main loop, while the Mee TH is right on the loop. So, by starting at Knowles TH (as I have always done) you add 2.2 miles. Otherwise the route is exactly the same starting at either TH. Route finding isn't bad, except for the confusing cattle/ATV tracks that connect between the Mee & Knowles THs up top. I've never done the route in fall, it will be interesting to hear what you find for water. Be sure to check out the super cool, huge undercut in Mee Canyon just above the exit climb. Hi Peter, My son and I did make it over to Knowles October 15, 16, and 17. We had fantastic weather and a great outing, even though it didn't turn out like we'd planned. We decided to go ahead and start at Knowles mostly because what we had read and all our initial planning was around going the conventional, clockwise loop. We really enjoyed the initial portion of the hike through the piñon and juniper, and the main part of the canyon (the Wingate) was spectacular and wonderfully secluded. When we got down into the bottom, however, the thicket was grown up pretty significantly and made for very slow going, especially with packs. We tried a variety of route finding, from following the wash to trying to getting up out of the brush on the flanks, but we made considerably poorer time than we had planned, getting in only about 8 miles the first night (we were at the trailhead at 1:00 after leaving from Denver that morning). Good news was we found running water in a number of places, including right as you come to the bottom of the canyon. After camping the first night, we made the determination that we wouldn't be able to get the entire loop done within the time that we had told family to expect us, especially because we didn't know if we would have faced the same kind of thicket all the way around. So we just messed around in Knowles and hiked out the next day. We were wondering if the heavy growth was an artifact of it being early fall, making the spring the ideal time to make the loop before the undergrowth has the entire summer to grow. We were disappointed to not do the loop, but still had a great time in a fantastic canyon. After we got out, we drove over toward Rattlesnake Canyon, car camped that night and did the arches hike the next day, which was highly enjoyable. We'll be back to the area for certain. Thanks for the help as we were headed out! Announcing my attempt to set a new FKT on the Mee-Knowles Loop this Saturday (5/28/16). I will be running solo/unsupported starting at the Mee Canyon TH and going clockwise. Set a new mark today. Ran the loop starting at the Mee TH in 8:21. These canyons are wild! I've never had so much cheat grass in my shoes and there was some sketchy scrambling involved moving along the river from Knowles to Mee, but I never got super lost and there was just enough intermittent water to filter in both canyons. Saw 6 backpackers and about 10 day hikers going to the alcove in Mee. SPOT track was sketch, but Strava track was much more accurate. I ran this loop yesterday as well, I won't be able to post my track from my watch until I get acces to a computer tomorrow night, but I came in at 7 hrs 21 min. Surprised I didn't see Giff yesterday on the route, what a coincidence we were doing it the same day! I started at the Knowles trailhead, this time is subtracting the 2 miles it takes to get up to the start of the loop. Congrats Andrew! I knew I saw footprints from somebody running in Salomons but wasn't certain if they were just going down Knowles or running the whole loop, I must have been just behind you all day. I'd love to swap stories sometime. Your strava says you ran it at 7:35? Did it not read something correctly? We were going opposite directions I think, I went down knowles up mee. Incredible that you guys independently picked the same day to go for the FKT! Strava reports "moving time", which is confusing - clearly the FKT is total time. Strava can also give an incorrect final result due to how it decides to pick the start & end locations (and GPS error), so it's best to check the Strava time against your actual start and finish times. In general it would be great if people provide a link to their actual GPS (gpx) file: I can't get your gpx file off Strava unless I have their paid membership, which I don't. Giff said he was going clockwise, which would be going down Knowles & up Mee, same as you. 7h21m is fast!